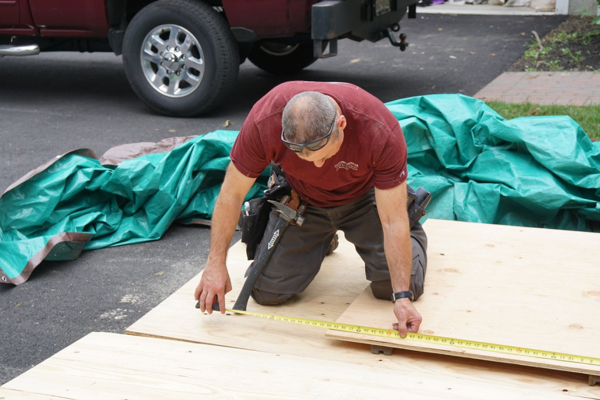 As a carpenter and general contractor, I typically wear knee pads when I’m tiling or working on a floor. On most projects, I don’t wear knee pads. I find knee pads uncomfortable and the straps tend to cut off my circulation. 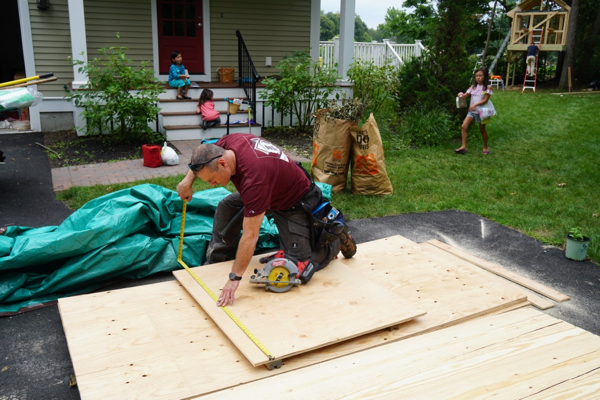 Most of the work I do requires a constant combination of standing, kneeling and squatting. The problem is, even in the short time that I am kneeling, Im still doing damage to my knees. I recently went on a search for durable work pants. I searched for pants that had padded knees and reinforcement in high abrasion areas. I wanted a pair of work pants that essentially would handle the work I do. MASCOT is a company that manufactures a broad range of high quality workwear and safety footwear.The Houston work pants caught my attention first because they offered padded knee pads as an option, and second, at $55.00, they don’t break the bank. MASCOT offers up to 21 different waist sizes and four different leg lengths the Houston pants feature a form-cut waist band, which ensures that the trousers follow and support all body movements. 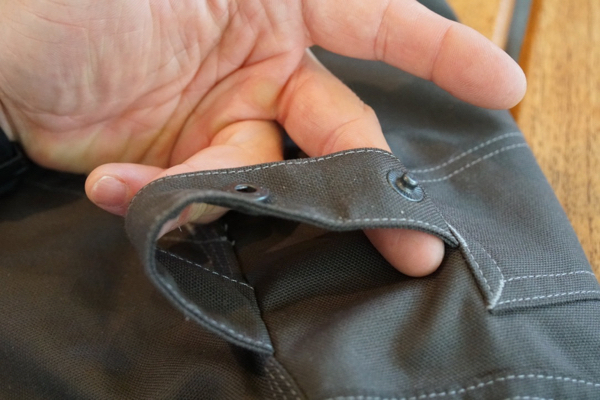 The waistband is cut in a way that sits closer to the body and does not gape in the back of the pants making the pants comfortable to squat in. The Houston pants are lightweight enough to wear in the summer time and are constructed out of 65% polyester/35% cotton materials. 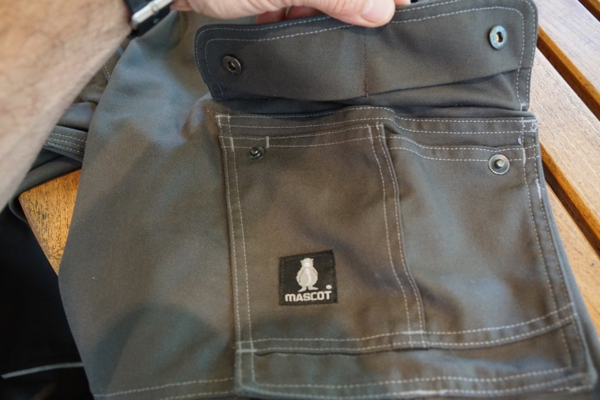 MASCOT uses fabric brands such as; CORDURA® and Kevlar®, for their wear resistance and pierce resistance. The pants feature a contrast color, durable stitching. The leg seams and crotch seam area has triple stitching for durability. 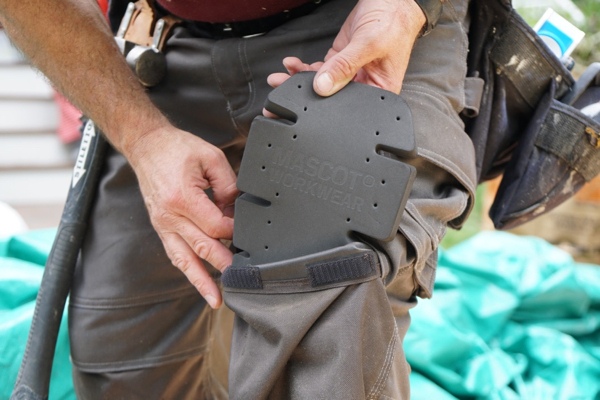 MASCOT Workwear produces three styles (sizes) of knee pads. This helps ensure each one fits to give the wearer ideal comfort. The Houston pants have durable, adjustable, polyester knee pad pockets with flap and top access. The flap ensures that debris stays out of the knee pad pocket and getting between your knee and the pad. Inside the knee pad pocket, located top and bottom, is a velcro attachment, for securing and adjusting the knee pad height. 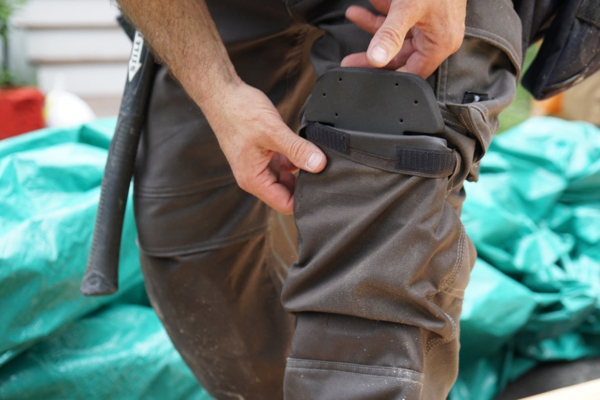 The Houston pants have an adjustable hammer loop that snaps to reduce the size to get it out of the way, or carry a smaller tool like a nail puller. Unsnapped and the hammer loop was perfectly sized for one-handed hammer holstering. On the left side of the Houston pants is a high pocket with flap, and hidden press studs. The right side has a reinforced ruler, cell phone or tool pocket and two narrower pockets, perfect for penlights, markers, pens or voltage testers. 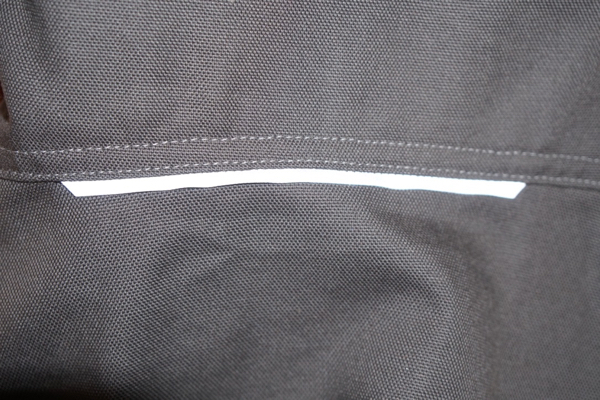 MASCOT places a 5-inch reflective strips on the rear of the pants, back knee area. These Hi visibility strips are highly reflective and provide some visibility protection from vehicles approaching behind you. 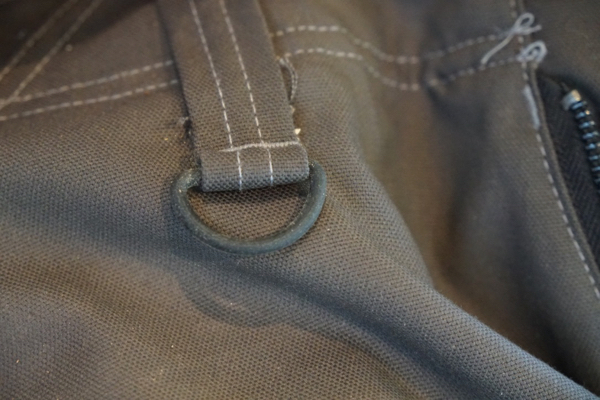 A black rubber “D-Ring” anchor, located on the right front of the pants, can be used to hold keys, lanyards, identification cards to the front of the pant. There’s not a lot to improve on these pants other than I would suggest that MASCOT consider adding reinforcing material to the side, rear cuff area of these pants. The knees and cuffs are usually the first areas to wear or tear. I’d also like to see pocket reinforcing, or even better, a metal clip added for a attaching a tape measure. The Houston work pants sells online for $55.00 that’s not only reasonable, it’s a great deal for what your getting. My search for a durable, light weight work pants was successful with MASCOT. 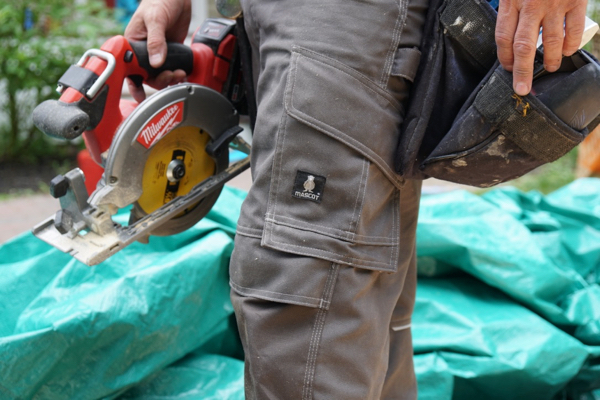 The Houston work pants fit true to size, are made with durable materials and stitching. While testing the Houston pant knee pads, my knee rarely rolled off the knee pad, a common issue with other pants. I tried to kneel down in different positions, twisting and turning and each time I landed on the pad. In the end, the knee pads made kneeling comfortable and ache free.